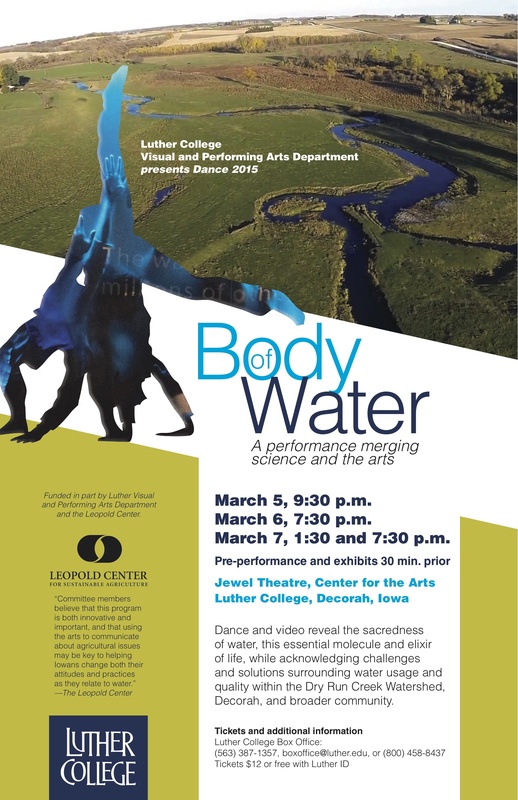 A complete story on the the relationship between the watershed and the performance piece is available on Luther College’s website. Des Moines Register writer Michael Morain wrote an extended article on the performance, Dry Run and water issues in their Saturday, March 14 issue, viewable here. John Lubke and his granddaughter Johanna at the stream crossing on his farm. Prior to the construction 10 years ago he had to drive 80 rods upstream for access to the field west of the stream. John Lubke, a Dry Run watershed cooperator, hosted a field day Thursday morning, Aug. 7 at his farm west of Decorah. John’s controlled stream crossing allows vehicles to cross this small creek to a neighboring crop field on the farm. For more photos and a story, please go to the 2014 News page. On Sept. 19, the Dry Run Creek Watershed council met to develop an incentive program structure based on project goals. The council discussion focused on cover crops, waterways and buffers, feedlot runoff controls and ways to reduce cattle access to streams in the watershed. Cover crops are of immediate interest, since there is funding available for seeding fields recently harvested for corn silage. Producers and landowners interested in fall cover crops should contact Paul Hunter, council chairman, at 563 382-8045, or John Lubke, council member and Winneshiek county soil commissioner. A recreation-season E. coli (an indicator bacteria) geometric mean that’s below than the Class A2 criterion of 630 organisms in each 100 milliliter at a designated monitoring site. Project participation by 50 percent of farm operators along Dry Run Creek. Another council meeting will probably not be scheduled until after harvest season. The stream has been identified as impaired due to high E. coli bacteria by the Iowa DNR. Water monitoring sponsored by the watershed council and completed by Luther College has confirmed the high bacteria levels. The watershed council applied for and received a grant from the state of Iowa to voluntarily address the issue. Please join us to learn more about the opportunities provided by the watershed improvement project. Because the water monitoring showed a variety of sources for the bacteria it is important to have involvement across the watershed to show desired results. Producers in the Dry Run Watershed near Decorah met in March to discuss implementing a watershed improvement plan, including possible management issues and practices. The meeting followed the Iowa Watershed Improvement Review Board (WIRB) approval of a grant application for water quality improvements in Dry Run watershed. The grant for $99,750 is one of 11 approved by WIRB this year and the Dry Run project is expected to start July 1 following signing of a grant agreement. “We have funding, we have goals, so now what?”, asked Paul Hunter, president of the Dry Run Watershed Improvement Association, Inc., a non-profit formed to seek funding. The Dry Run group also discussed applying for a small grant to assist producers in planting cover crops on watershed acres, and reviewed a menu of practices used in other northeast Iowa watershed projects, including Hewitt Creek near Dubuque. The group will hold a larger watershed-wide informational meeting for landowners and operaters in the watershed later this spring following field work. The grant calls for incentives to be developed locally, and their participation early in the project timeline will be needed to be successful. In 2010, a group of farmers in the Dry Run Creek subwatershed of the Upper Iowa River watershed joined together to become leaders in efforts to address the issue by forming the Dry Run Creek Watershed Improvement Association, Inc. (or DRC watershed council), a non-profit. To determine the scope of the bacteria issue they partnered with specialists from Luther College, the IDNR and Iowa State University Extension to develop and implement a water monitoring and stream assessment plan. With two years of data, the DRC council believes it has adequate information to understand the impairment, and to coordinate with the partners and the Winneshiek Soil and Water Conservation District to implement locally-prioritized solutions to reduce the level of indicator bacteria in the stream. Dry Run Creek was listed on the Iowa Department of Natural Resources 303(d) Impaired Waters List in 2008 due to high levels of indicator bacteria that exceeded state water quality criteria. Farmers, Luther College students and governmental workers are joining forces to improve water quality in a unique project involving the Dry Run Creek Watershed just outside of Decorah. A nearly $100,000 grant just received from the State of Iowa will allow the Dry Run Creek Watershed Improvement Association to be able to offer cash incentives to landowners to make changes that will lower bacteria counts in the streams that make up the watershed.